Virtualization is typically used to mean by processor virtualization. Besides the processor virtualization, there are other types like for disks or network. Virtualization is a hardware support that facilitates the operation of virtual machines on a real computer or accelerate some work. With virtualization, we can run multiple software systems on s single hardware. This can be different operating systems. 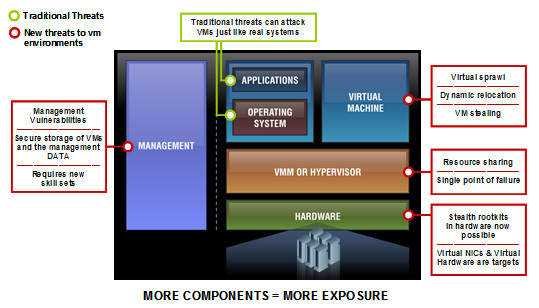 Virtualization makes sense if a hardware system is not busy and the resources is used in parallel for other systems. Increasing the frequency in processors is simply not possible to acheive by the processor manufacturers like Intel and AMD in particular, they rely on alternative performance-enhancing techniques for the processors. In addition to multi-core processors, multimedia enhancements and 64-bit virtualization functions are considered as the pioneering development. The most important feature of virtualization is the reliability. If an application itself, or even the entire operating to face a crash, the other virtual machines are still running on. The operation of different applications in multiple environments is the most common application. For example, applications for security and data protection to keep them separated. But in order not to provide own hardware for each application, virtual machines are created, on which then the applications can work separately. At first glance, virtualization seems to be something for servers. However, normal users can get benefit. For example, two environments for working with the computer. One is the normal one and the other for connecting to the Internet. If the Internet acessing part is malware loaded, it will be deleted and re-installed. Something can be automated, for example, at every system startup. So you always can have a clean system. This could also go good so far for insecure programs running in a dedicated environment, so that the operating system can not be attacked from the outside. A virtual machine is a software container on an operating system and is installed on it too create an imaginary world, it can emulate the common hardware components. Usually the standard operating system drivers allow them to appear to the emulated hardwares. Virtual machines have only a limited graphics performance. 3D software and playback and editing videos is not fast enough feasible in a virtual machine. With the virtual hardware it is meant that the operating system on the virtual machine. As CPU, memory, video card, disk drives and interfaces available to the parallel operation of systems not directly available, a virtualization software monitors the access to the hardware. It organizes and manages the virtual machines (VM). This task can, for example, can be taken by a hypervisor. It needs a small part of the hardware performance, especially processor to do its work. In operating system virtualization only one operating system is running. More virtual operating system environments are generated that works on the current programs as a normal OS. The applications see only the applications with which they sharein their virtual environment. Virtual environments such as stand-alone systems appear to the outside. When a system virtualization is used or more complete systems is modeled on, the arbitrary operating systems becomes really feasible. The systems are based on real hardware. So you can simulate different virtual systems are equipped with different hardware. In one variant, the virtualization runs on the existing operating system, on which another operating system is installed. In parallel, the host system can be used normally. In the other variant, the virtualization runs directly on the hardware with multiple operating systems and their applications. Examples are the softwares from VMWare, Virtual PC, Virtual Server and Parallels. Cite this article as: Abhishek Ghosh, "Virtualization : Easy Explanation of the Technology," in The Customize Windows, May 6, 2013, April 20, 2019, https://thecustomizewindows.com/2013/05/virtualization-easy-explanation-of-the-technology/.